Bleed Eagles Green: Philadelphia Eagles Blog: Tony Hunt: Another Wasted Draft Pick? Tony Hunt: Another Wasted Draft Pick? 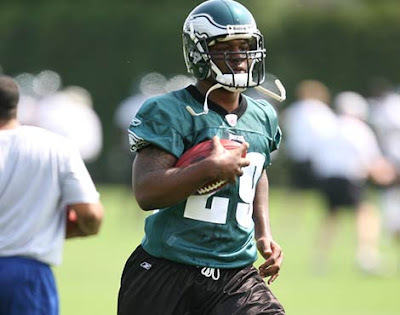 CBSSports.com reviews the top training camp battles facing each team in the NFC East. Clark Judge has Booker as the number two guy behind Wesbrook and Buckhalter edging out Hunt for a possible roster spot. No one pushes starter Brian Westbrook, but who joins him in the backfield in short-yardage situations or takes over when Westbrook needs a break? That's what the Eagles are about to find out. They've gotten more mileage out of Buckhalter than expected, but the acquisition of Booker is an indication they're looking to upgrade the position. Hunt is a third-round draft pick who barely played a year ago, but the Eagles have hopes for him as an inside runner. He's a different kind of back than Booker, who's a legitimate receiving threat, and it might be too early to bail on him. But the question is: Is it too early to bail on the never-say-die Buckhalter? Remember, he averaged 5 yards a carry and scored four times in limited duty. I believe it'll be Hunt and Buckhalter playing for one spot, with Booker a lock. If Hunt doesn't secure a roster spot, he will join Ryan Moats as another wasted third round draft pick. When Hunt was drafted we all thought that he would be the answer to the need of a short yardage back. Hunt and Westbrook could have formed the current day Thunder and Lightning, bringing back memories of Charlie Garner and Ricky Watters. Maybe training will bring an injury to another teams' top running back and there will be a market for Buckhalter. As Clark mentioned Buck did manage to post an average of 5 yards per carry in 2007. And for a guy coming from a 1-15 team and who had difficulty getting on the field with the Dolphins, it is amazing that everyone is just anointing Booker as the number two. But Andy knows best...at least that is what I keep hoping!